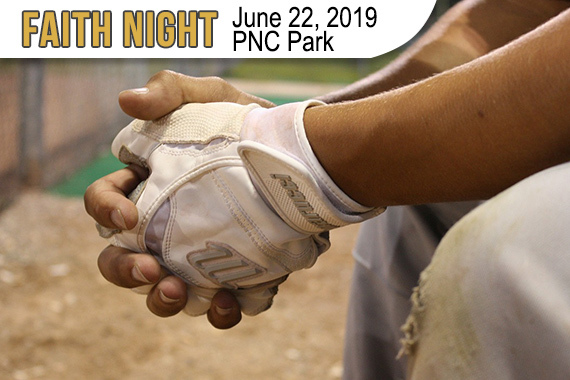 (BEAVER FALLS, Pa.) – The Geneva College community is invited to attend the seventh annual Pittsburgh Pirates Faith Night at PNC Park on Saturday, June 22 at 4:05 p.m.
Join the Geneva faculty, staff, alumni and students for a night of baseball and Christian fellowship. First, cheer on the Pirates as they face the San Diego Padres. After the game, Faith Night attendees will relocate to seats on the first base line to hear stories of faith from Pirates manager Clint Hurdle, coaches and players. Their testimonies will focus on their faith in life and their career in baseball. Tickets are available for $30 and include a t-shirt and $5 concession voucher and should be ordered by June 10 at https://www.geneva.edu/pirates-faith-night.